There are two ways to make pandan cakes. One requires you to blitz pandan leaves to extract the juices which are then used to make the cake. This is how I usually make pandan cake when I have the time. But there are times when I am lazy or I just want to eat pandan cake PRONTO!. When that happens, I bake a pandan cake using pandan paste. Yeah, I have a perpetual and unreasonable need for pandan cakes. The cake is very, very soft and so tasty I can easily eat the whole cake by myself. Thus, I shall share this recipe in hopes that many others will bake this cake and enjoy it like I do. Start by beating together egg yolks and sugar. The mixture will turn a lighter shade after about 3-4 minutes of beating. Add coconut oil and continue beating. Once the coconut oil has been incorporated, add coconut milk and pandan paste. Add the sifted cake flour and mix until just combined. Set this aside. Add cream of tartar and continue whisking. Gradually add sugar, whisking all the time until the egg whites form a stiff peak. Fold 1/3 of the meringue into the yolk mixture. Beat it in. Gently fold the remaining meringue into the egg yolk mixture in 2 batches until no streaks remain. Transfer the cake into an UNGREASED tube pan and bake at 170°C for the required time. If the top of the cake cracks or becomes too brown, place a sheet of aluminium foil over it and continue baking. Once baked, invert the pan and place it on a raised wire rack (or any other raised device) to cool completely. Unmold the cake carefully and enjoy! Beat together egg yolks and sugar. The mixture will turn a lighter shade after about 3-4 minutes of beating. Add coconut oil and continue beating. Personally, I think that pandan paste is better than pandan essence… and I believe that this cake must be very fragrant!!! Three cheers for your pronto pandan cake!!!! Zoe you are so right – panda (or anything essence) is not allowed in my kitchen. YUCKS! 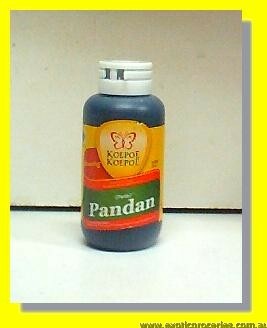 May I know what is the brand of the pandan paste from Indonesia? Hi Diana, Pandan Chiffon is my favourite chiffon cake! On your recipe, the pandan paste shows like 25 ml and not 2.5 ml. HI Wei I think it is the font – I think they should know right? I mean can you imagine 25ml of pandan paste? LOL. I’ve tried baking chiffons a few times before using other recipes (5 or 7 eggs) with similar method. Cake texture is usually soft and tasted good but the problem I always encounter is that the cake will drop out from the tin when cooling. Any idea why it happens & how I can improve? Hi Jas this means the cake is underdone. You may need to bake it at a higher temperature or for longer! Because everyone’s oven is different, you need to learn how yours work. Experiment a few times and adjust the temperature and/or cooking time. Hope this helps! Underdone? Hmm.. ok will try to bake longer the next time! Thanks! Always wanted to bake a chiffon cake for my child as she loves it very much from a particular brand, but personally, i felt it’s a little too sweet! Thus, thanks for this recipe! HI Sarina I totally understand. I also cannot tahan anything sweet!! New to baking n would love to try this, would like to know what is the cream of tartar for in this recepie n can it be omitted? Thanks for the reply! Can I use small cupcake cups of I do not have chiffon pan? Hi Joyce when you say “top” it is the part that is from the bottom of the chiffon pan? Hi Diana, yes the “top” is the part from the bottom of the pan. Just don’t know why it is damp. But the inside of the cake is ok. Thanks. Wishing you and your family a Happy Chinese New Year. Hi Joyce it sounds like it has not been baked enough? Hi, I have a 25cm tube pan. How should I adjust the quantities? For 25cm pan, you should use 7 eggs. You can adjust the measurements accordingly. Hi Diana but your recipe for 25cm above uses only 6 eggs. I used 6 eggs for 25 cm and there was too little batter. The cake rose beautifully but not to the height that I wanted. So I assume 7 eggs need to be used for 25cm? 6 eggs worked fine on mine. Maybe you want to increase if your cake was not tall enough. Great! Thanks very much! Can’t wait to try! Hi, if I wanna extract juice from pandan leaves, how do I adjust the recipe? Hi If you want to use pandan juice it is best to use a recipe that incorporates that. Hi i tried your recipe but the top part browns half hour halfway during the bake. You mentioned to cover with aluminium foil then continue baking. Wont taking it out n putting it back causes the cake to sink due to the temperature changes? Or should i just dont bother about the browning and continue baking all the way? Hi Trisa Just open the oven door, stick the aluminium over the cake and close the door again. There is no need to take the cake out. Alternatively, you can experiment with baking at a lower temperature, or switching to a lower temperature half way through but bake a bit longer. Hope this helps. Hi Diana, may I know the size of pan you used in inches. Thank you. I tried your recipe for pandan chiffon as well as orange chiffon. Both attempt were succcessful. Thank you very much for sharing your awesome recipe. HI! I am going to try your recipe today. Just wanted to let you know that the pandan paste you featured can be bought at Sun Lik. Hi no the paste can only be bought in Indonesia. You can try another brand from Sun Lik or PH. Hi Diana! Wow this cake looks so delicious, I can’t wait to try it! I love pandan too and I have been searching for the perfect recipe, this looks so promising. I have not baked a chiffon cake without baking powder and salt so I decided to clarify this with you first before baking (using canola instead of coconut oil). Aside from the flavor, how different is this from the your other chiffon cakes, since it doesn’t call for baking powder and salt? I checked your other chiffon recipes, and they called for such ingredients. Also, can these be baked in a cupcake pan, or regular cake pans (if making a layered cake)? Hi Kenzie you can actually add baking powder and salt of you like but I found that they are not necessary. In fact if you make a good meringue you don’t need to add baking powder to chiffon cakes! You can make this in a regular pan or cupcake liners like the Hokkaido chiffon cupcakes! Good luck! Hi Miki I do. I shall post it soon! Dear diana, thanks for sharing your receipe. Appreciate it. tried your orange chiffon cake.. it was a success! The best thing is its not sweet – its impt esp i have kids. Do you have pandan cake receipe using real pandan leave juice? Can i just replaced the orange juice with pandan leave juice. Does it work this way? Hi Joyce I am so glad the cake turned out good! i dont hv cream of tartar. Can i substitute w/ baking powder? I read, they serve d same purpose. if yes, same measurement + method? I chanced upon your blog recently and since I just gotten a new stand mixer, I decided to give the orange and pandan chiffon a try over the wkend. Followed the baking temp and time on the recipes, even left it upside down overnight to cool (I baked it late at night) and both cakes turned out great!! Except, the cakes did not have the brown ‘skin’ on the sides but only had it at the bottom. When I unmould the cakes, there was light colored ‘skin’ left on the tin, scrapped it, ate it and it was nice & moist. Wonder if I need to bake it for a longer time? Just afraid if I baked it longer, the chiffon may be too dry? Anyway, love your blog and recipes, can’t wait to try more of the recipes! Tried baking chiffon cakes a number of times but failed. When I used cake flour, it looked beautiful just hot from oven however aft cooled, the top sunk down and worst part when it’s cut, the bottom of the cake from the pan was follow. Meaning there’s a big empty space at the bottom of the cake. Appreciate it if you can help me with the problem. Thanks very much! Hi Jena it sounds like you didn’t fold it well. Also you must lift and drop the pan a few times so the bigger air bubbles are released before baking. In addition, your oven may not be hot enough – you may need to buy an oven thermometer to check. Don’t give up! Hi diana….the coconut milk must be those fresh type from market or can i use those packet type? Just to add on, the pandan paste can be easily bought from sheng siong too. Thank you very much for your wonderful chiffon recipes. I have tried baking banana chiffon and pandan chiffon cakes and they were total success! You can’t imagine how many rounds I have failed baking chiffons from other recipes till I tried yours. Its not only total sucess, I’Ve also got the taste and texture that I have been looking for! Love your blog and i’ve been trying out a couple of recipes! For the pandan chiffon cake, everything is good for me, just that the cake doesnt seem to rise. Instead of a chiffon cake, it’s more like a normal cake. Do you know what could be the reason that the cake does not rise to be soft and fluffy? Hi Ivy there can be many reasons. One is you could have over/under beaten the egg whites; or you didn;t fold it into the yolk batter carefully; or the oven temperature is not accurate. Many factors..
hi, if I wish to use pandan juice, how much can I substitute with? also is cream of tartar absolutely necessary? thanks for your help! Hi Joe, yep yep, lemme bake it and blog it. Keep an eye out for the recipe! Hi, I often ended up messing up the beautiful chiffon cake at the final stage and getting a torn cake. 1. Do I need to at least grease the bottom of tube pan? 2. Or will it be a good idea to use parchment paper for the bottom and side of tube pan ? Never grease or use parchment paper for chiffon cakes. it your cake is torn, it is probably not dry enough. Bake a bit longer. Hi, the cake is beautiful after bake. however, I had difficulties to remove the cake from tube pan. can you advise on the steps. thx. Hi, I tried baking the cake and always experience the cake beginning to shrink a bit near the end of baking and when taken out it kinda sinks in a little whilst the sides still sticks to the tin. May I know the possible causes and how to rectify. Hi it also tends to crack first around the sides. Any advice? Thank you so much. Hi Diana, I made this yesterday using the same Pandan paste but the flavour wasn’t strong? What happened? Could it be due to the paste was left in the fridge for too Long? Hi Ivy, how odd. Can you smell the pandan? If not, I guess it is time to buy a new bottle..
Or should my oven thermometer read 150C in the fan-forced mode when the recipe calls for 170C convection? Joanne your question is not complete..
My question is, should I lower it anyway even if my oven thermometer tells me that my oven is at exactly 170C when it has been dialed up to 170C fan forced? The oven thermometer is a small device I put in the oven – I’m not referring to the oven thermostat. Hope the question make sense? The oven thermometer is a small device I put in the oven – I’m not referring to the oven thermostat. Hope the question makes sense? I hope you dont find me silly asking this question. The tube pan is kinda “tapered”. Meaning, the top diameter is not the same as the base diameter. hi you should measure from the top! I made this today, baked it at 160C (fan forced) and it came out deliciously moist & soft! Yes it can. Reduce the baking time but bake at the same temperature. Why my pandan chiffon cake not cook ? I really have no idea also.. Hi!! Diana, I saw your kitchen mixer, may I know what brand is it??? It look very sturdy to me. Can you advise where n how much you pay for it?? Btw you have a very interesting blog. I ever done your prawn paste chicken n it is awesome. My children loves it very much. Hi the one in the photo was a Kenwood Chef, which I had been using for more than 10 years. I have tried the 18cm pandan chiffon cake, it was very good( better from the shop in uk). I brought the 25.4cm Angel cake tin and use the recipes above 6 eggs, it failed, Very disappointed. Can you tell me what went wrong? Thanks for the recipes and possible for green tea n black sesame chiffon cake, would love to try. HI May, since I wasn’t there when you made the cake, I cannot tell you what went wrong. For Chiffon troubleshooting, please look at http://thedomesticgoddesswannabe.com/tell-me-why/. Thank you for the quick reply and I cannot wait for the recipes. Hi Diana, this is such a beautiful cake. I love chiffon cake and have baked quite a few except the pandan flavor one. I will get the paste and try this recipe of yours! My son loves “green cake” and I regularly bribe him with this when we go to the asian grocery. I made one this week and he said it was even better than the bought one. Thank you for a great easy to follow recipe. My son loves “green cake” and I regularly bribe him with it when we go to the asian grocery. I made your chiffon cake this week and he said it was better than the bought one. Thanks for a great easy to follow recipe. Hey Diana, I decided to try your recipe with the 23 tube pan but was surprised that the batter was so little! It filled only 1/4 of my 23-tube pan, if not less. It rose to 1/3 after baking but I don’t get a high cake which I normally do with another recipe on the internet. I’ve been baking chiffon cakes many times over and always with fantastic results. That’s bizzare.. This is actually the most popular chiffon cake recipe on my blog and many have tried and 99% have succeeded. I am so sorry to hear that your cake didn’t come out right. You can measure your pan again to check – also if you normally use for instance, a 6-egg recipe for your pan then you have to also use a 6-egg recipe this time. I hope this helps? Hi Diana, noticed yr recipe on padan chiffon cake does not include baking powder. The earl grey chiffon cake needs baking powder. Please clarify. Tks. Baking powder is optional. It helps the cake rise so you can omit it if you wish as long as you can whisk a good meringue. Hello! Love your pictures! I tried making pandan chiffon today after much coaxing from my mum! But failed terribly 🙁 i used the 3 egg recipe, but my tube pan was a non-stick one. Is that a problem? After seeing the top of the cake crack (not yet brown), i used a baking tray to cover the top and continued baking for the remaining 20 mins. Afterwards the top was brown and cracked, but it sank in so much, so did my heart 🙁 it was hard and hardly like a cake. Would you be so kind to let me know what i could have possibly done wrongly? Thanks so much! I suspect i might have beaten my yolks too much as they were frothy when i added the oil. Hi Diana. My aunt visited me from Singapore recently and introduced me to your blog. She even bought me the pandan paste from Indonesia as you can only get frozen pandan leaves here in selective shops in Perth. In any case, thinking about having to squeeze juice out of pandan leaves already does my head in! Oh! I think my message was cut off. What I meant to tell you was that we made this cake using your recipe and the kids love the “green” cake, probably the only green thing they won’t turn their noses up to. However, I was thinking if I use half of the 6-eggs recipe, do you think it would work if I scoop the batter into cupcake paper cases and make cupcakes instead? I know I have to be quick before the batter collapses. I tried your other recipe tonight, the ondeh ondeh recipe but just plain cakes. The kids still love them although using butter does make the cakes heavier. I will cut the pandan paste to 1/2 teaspoon next time as it was too green for me. So do you think using half of this cake recipe batter to make cupcakes will work? Thanks. Hi Geraldine yes you can make them into cupcakes. Bake at the same temperature but reduce baking time. Okay. Will give it a try and feedback to you. Thanks again for a wonderful recipe that doesn’t waste any egg yolks! I tried the recipe ,it was marvellous. However, can I change the Pandan to Chocolate? Can you please give me advice? Wah Serena! I think it’s only polite to wait till Diana decides she WANTS to bake a lemon chiffon cake with 7 eggs! She doesn’t bake upon request, and I think you should respect that this is her blog, and she is not obligated to bake something just because a reader requests for it. Googling will yield you many many results – maybe you can try doing that first! Do you have the recipe using fresh Pandan juice with packet coconut milk? Hi I don’t have one on the blog currently. Just baked this today.. Follow every step and methods for the 18cm pan. Color came out exactly the same. Texture spongy.. But my cake did not rise up .. The height is somewhere like the egg tart height. My 2nd and 3rd attempt result are the same.. It rises to the top of the tin in the oven.. But as when the baking time is about to end, it shrink down nearly half..
Had beat the egg whites till stiff peak form. Could it be oven temperature unstable as mentioned in the FAQ column? Hi Pat pls see £7 and £8 under Chiffon woes. Hi can you post a picture of the pandan paste or give the brand name so i can check out at sheng siong..
Hi Serena the brand name and photo are stated – just click on the link in the post! Just to few qns to ask. Must we definitely use a tube pan for chiffon cake? Coz I only have the normal circular Alum Pan w/o the hole. Will it affect the end product? Also I don’t have a mixter at home so is it possible for us to beat and whisk the ingredients manually? Again, will it affect the end results? Thank you in advance!! Hi Diana! Thanks for the wondeful recipe! Initially I wasnt really confident that it will be successful as I heard from many people that baking chiffon cake is not easy at all! However, ive used your recipe and it works perfectly since the 1st try! The top did not crack at all as well! Just baked my first chiffon cake (pandan) following your recipe. The cake rise till almost brim of my 23″ tube pan but shrank when cooled. I am not bothered too much as you have “warned” us about it. The crack top too, I covered it with aluminum foil so not a problem. Whilst writing to you, I am waiting to remove the cake from the pan. It did not drop out and I didn’t want to pry it out as it might get stuck to the pan. My question, if I allow the cake to cool completely, will it drop out by itself? I am actually quite happy with my first try, will wait and see how the family like the cake. If positive feedback, will try other flavours. Thanks again for your very honest sharing of your recipes! I unmould the cake but was a bit disappointed with the height of the cake. When I removed from the oven, I was excited that it “grew” really tall, at the brim, but when cool, it was the height of my butter cake! Thank you for your very quick response! I know when whisking egg white, it should form peak. I know there is such a thing as overbearing the egg white which would affect the final result of the cake. My question, how long is considered overbeating egg white. When we add sugar gradually to the egg white, how long should we beat sugar in, few seconds interval? I mentioned in an earlier question to you that my chiffon cake reduced quite a bit in its height. It’s due to overbeating of the egg white? I think when unmoulding, I must have caused some “damage”. Hi Diana, thank you for referring me to view videos on the correct way to beat egg whites. After viewing the videos, my egg white turned out beautifully, firm & thick. I have been trying for the past 3 days and my 5th pandan chiffon is in the oven and I am hoping this time, it will turn out the same as your picture. I have a question, does the height of the chiffon cake depends very much on the egg white? My 5th pandan chiffon turned out fine but the height of the cake did not reach the brim as yours in the picture. Any clues? My only concern is that after inverting til completely cooked, I un-moulded it, wrapped in cling wrap and put in the fridge for frosting the next day. The next day, the brown skin on the dome part was damp and sticky.it peeled off too easily when my finger gently touched it. May I know what causes that and how to prevent? Thanks so much! Hello I think you can store without the cling film maybe? When I first made the Pandan Chiffon in August 2016, it turned out as well as I had expected. I have been trying for the past couple of days, it turned out disastrous. 1st day oven too hot at 170 decree centigrade, the top collapsed (which was the bottom). Second try, temp not hot enough, I started 170 but mid way I lowered to 160. Cake dropped out so I know not cooked enough. Today, followed recipe to the “T”, 20 mins in to the baking, I tent the cake because it was quite burned & cracked. I continued to bake at 170 for a total of 50 min. The side of the cake towards the bottom or before unmoulding the top was not even, like it has collapsed. Too hot? It is harder to have a perfect Pandan Chiffon than the Gula Melaka Chiffon. Don’t know whether you have located source but I just chanced upon it. Troubleshoot:Chiffon Woes, blogger Rei posted information sometime in 2008. You were not wrong to say making Chiffon cakes is notoriously tricky. This whole week so far, I made one Chiffon cake a day and every day, the cake turned out wrong:cake caved in, oven too hot; cake dropped out easily, under baked, and today, cake looked almost perfect but I know something not quite right, cake should not be moist & when I cut the cake, it does not bounced back. I actually lower the temp baking betw 150-160 degree centigrade for one hour, I tent the cake. Mine is an old oven so temp could be a problem. I am going to bake one last time tomorrow, stick to my new temp & bake it longer, maybe 1 1/2hr. If I still fail, I will have to attend your class again for making of Chiffon cakes. Oh dear. How did it go today? I did it 2 days ago. It did not cave in, so good sign. I baked it for about an hour 15 mins at 160 degree centigrade. It is not as wet but the sides are not as brown as your chiffon cake. I need to bake it longer. I am only afraid too long in the oven, would the cake collapsed? It took you 50 minutes to bake the cake beautifully, mine took an hr 15 mins still not well done. I guess it’s the oven. My husband said he’ll buy me a baby belling. Same amount or flour /oil? Sorry i meant all purpose flour & corn oil with same amount ? I’ve tried making this today (twice) but the cake sunk and was not fluffy. I’ve flipped ot over, let it cool, etc. but it couldn’t work. May I know why is this so? I have a small oven which can bake 1 cake a time. Can i prepare 2 portion of cake batter first and keep 2nd portion while waiting for 1st cake to be baked? Or do I prepare the cake batter when I am ready to bake 2nd cake? Hi Rachel for best results the cakes should be baked immediately so I think method 2 will yield better results. one is a lot watery and less concentrated than the other. May I know whether to preheat the oven for this recipe? I read through but the recipe does not mentioned it. If need, will preheat the oven at which temperature and time? Hi Candy you have to pre-heat your oven for all bakes. This was my first chiffon cake ever, and it turned out WAAAYY better than I expected! It was so soft that I couldn’t unmold it without squashing the sides, and couldn’t cut without flattening it. But the taste was just awesome. Perfect level of sweetness, and I can’t get over how soft it was. Thank you so so much for sharing this! Hi can i know what type of coconut milk are you using? can i use uht coconut cream instead of fresh coconut milk? if yes may I know which brand of coconut cream. Sorry but I have problems getting fresh coconut milk. Hi Clare, I usually use the tetra pack ones from Ayam. May I know if I use the recipe for cupcakes, how long will I need to bake in oven? Thanks! Haven’t made Pandan Chiffon for a few months since I last touched based with you. I made one yesterday and one today, both flopped, same problem, cake didn’t rise, not as soft as before though still edible. I think it has to do with beating the egg white. I knew it won’t turn out well because when beating the egg white, it was not firm. The firm peak wouldn’t form, quite watery. I knew the eggs were not totally fresh. This morning I bought fresh eggs but still the peak of egg white was not firm. I knew if I complete the whole process, the cake will turn out like the one I did the day before. I threw the mixture away. It must be very disapointing indeed! I’ve used her recipes hundreds of times and it has always turned out fine. Was your equipment dry and non-oily when the egg whites were whipped? Perhaps a bit of yolk accidentally “contaminated” the whites? Even with no contamination, this small action guarantees a firm whip every single time :)) Good luck and hope it’ll turn out great next time! Thanks Emily for the tip about squeezing a few drops of lemon juice to egg whites. Hi Margaret is there something wrong with your mixer? I have used old egg whites and they whipped up fine.. I tried baking twice they were not brown on the sides except the top. Do I have to bake it longer? Btw what brand oven you using? Planning to replace one. Hi I am using a Bosch Series 8 oven. 🙂 Maybe bake at a higher temp? Thks for yr recipe. I newbie. Can i know which qty sugar is to butter n which is for meringue pls. Hi, I’ve tried your recipe several times and I strangely only succeeded the first time (beginner’s luck I suppose). Subsequently my other pandan cakes always seem to sink at the bottom when I remove it from the pan. 🙁 I don’t know why! Is it the whisking of the egg whites that’s resulting it to sink? It could be. As i was not there when you were making the cake, I can’t really tell. Couild you please convert to cups and tablespoons and teaspoons. Thank you. Hi you can convert using tools provided on Google. Hi! I finally found the pandan paste (it was available at the mama shop downstairs 😑) so just tried this cake. Thing is, im puzzled why is there only 4 eggs for the 21cm recipe when your other recipes usually call for 5? Ive tried it out as it is and it is really short. Also, can I ask a silly question? I know you usually use 65g eggs, is 65g the shelled or unshelled weight? I used eggs that weighed about 60g but only 50g unshelled. Its been a long time since I made chiffon cakes so I kinda forgotten many things it seems. 😅 appreciate your help! Hi, I have two 18cm tube pans. Do you think I could double your 18cm recipe and pour the batter into my two 18cm pans and bake them side by side in my oven at the same time? OR should I make one at a time? Thank you. sure. as long as your oven is big enough you can bake them together. Your recipe is amazing! But my Pandan cake batter did not come up to the top of the cake tin. Based on your earlier comments , I can increase to 7 eggs – do I still keep the rest of the ingredients the same? Eg 80g cake flour etc? add an extra egg white. it should help. hi Diana, gonna try baking this for the very first time! if my standing mixer only comes with 1 mixing bowl, can i transfer the flour mixture to any other big eating bowl, and use back the one and only mixing bowl to whisk the merigue? as mine is the faced out version of kenwood mixer (kmix), doubt i will be able to get another matching mixing bowl.